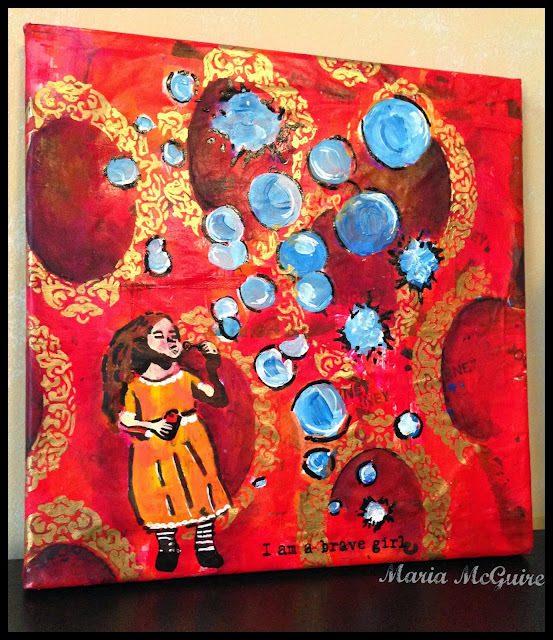 Featuring her Bubble Girl stencil from StencilGirl! My canvas (12" x 12") didn't start out in a way that I would have thought. It actually started out as this blotter paper on my desk that I had been playing with a previous project on. I had just laid down the stencil to play and see what the impression would look like on my blotter paper and one thing led to another and I ended up adhering the finished art from my desk right on to the canvas. So...yes, sometimes just playing around turns into something more. The frames you see in the background are Jessica's Frames stencil from StencilGirl. They were added in after the Bubble Girl was already stenciled. The journey stamp is a old Making Memories travel stamp and the "I am a brave girl" stamp is from Melody Ross by Unity Stamp Company. Now it is time to see what all the other artists did with Jessica's Bubble Girl Stencil from StencilGirl! 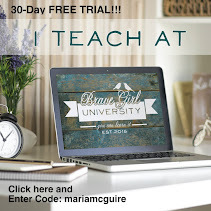 But....before you go, make sure you leave a comment because Jessica is giving away one of her stencils and all of the comments left on the ENTIRE blog hop are eligible to win! oh my gosh! That's a GORGEOUS painting Maria! It was a great idea to add the frame stencils as well, looks really amazing! Amazing....the colors are so vibrant and to think you started with blotter paper. Clever...and I love the recycling. Those frames work very well with the Bubble Girl. I never would have thought to use the frames with this stencil, but it looks terrific. Thank you Maria - you always amaze me with your creative pairings. Love your canvas. The fact that it all started with the blotter paper makes it that much more amazing. 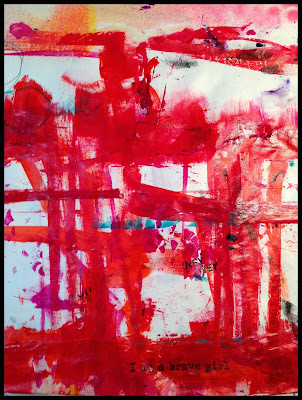 Don't you love when some scraps turn into beautiful art Maria! Of course your creative ideas and technique have a lot to do with that. Love the combination of the two stencils! Wow this is really amazing! I love the colors you used and the stencils fit so well together! It's a brilliant artwork! Such a fun stencil! Love how you used it! Maria, this piece is a-mazing! I love that you used your blotter paper that your lovely "messies" were on.. I love using my art table papers for that.. came out great, Maria. The gold and the frames give it a "greek" fell. "bundt". Great job. Love this brightness! It turned out so well! What a glorious painting, Maria! Like Corrine's piece, I am amazed at how this piece evolved. An unintentional beginning taking you to such a satisfying ending! Love it! This is STUNNING! Love the rich colors! Maria, I really LOVE this! The rich complementary colors, inclusion of text :) ...everything about this! Is a Great Canvas, I want It! What a nice new stencil. Great use of the Bubble Girl stencil! So many memories of blowing bubbles! A very happy version of bubble girl , great use of this fun stencil! 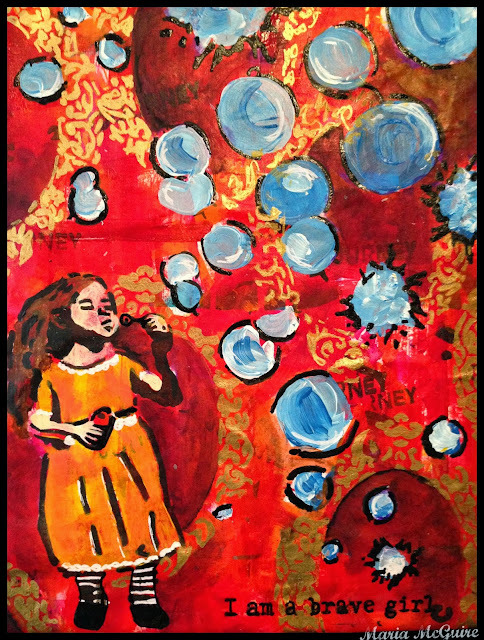 love your bubble girl - what fun! so cheerful and joyous! SCRUMPTIOUS! Love the colors and this stencil is a MUST HAVE! Definitely going ot have to add it to my small but ever growing stencil collection! TFS! 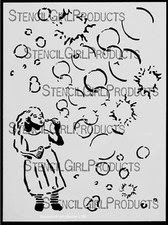 Just a beautiful interpretation of this Bubble Girl stencil. loved the colors you used!! So rich! Love the way you've colored the bubbles and her dress, especially. You are a TALENTED girl! 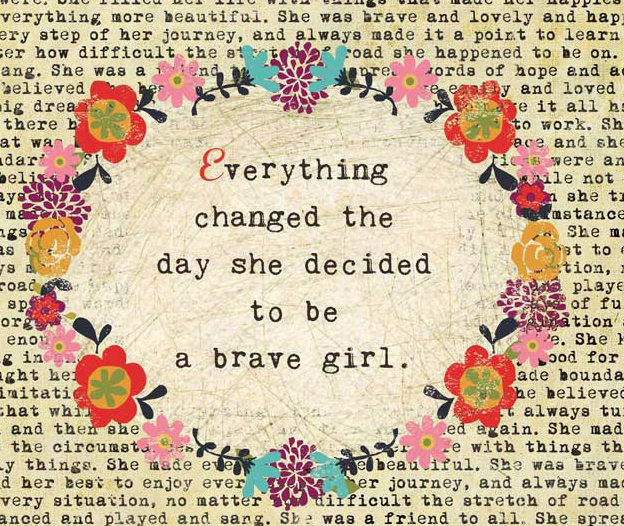 :) I love this Maria! It amazes me that you could turn a blank canvas into something so beautiful.